When are we going to hear about his side of the story? Considering how close and passionate we all have been to the hunter. It needs certain character added to it! Can u guys at Techland come out with something good about the hunter's previous background and how he develops into the monster that we all care about? It can be told in many ways. One example is we the survivors need to collect scattered notes or voice recordings or both (of someone describing the event or the hunter's monologue prior to his transformation). Maybe u guys have better ideas but really, we need one good story for all the btz fans! I just got excited! It would be a perfect game expansion! 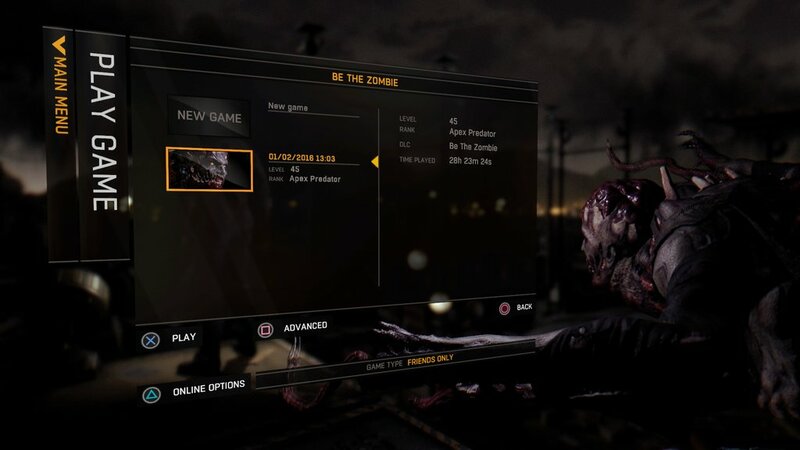 But more to the topic, Be the Zombie as it exists now is most likely in reality feature complete with the Following, but I really, really hope Techland have enough development time and funds for an alternate mode for Be the Zombie where we invade and everything works the same as in a normal survivors game (zombies/hostile survivors/quests), but new PvE activities are added for the Night Hunter/survivors such as collectibles only available in this mode, like you suggested EnlightenMe, and the game mode is turned into a kind of hide and seek alongside it. 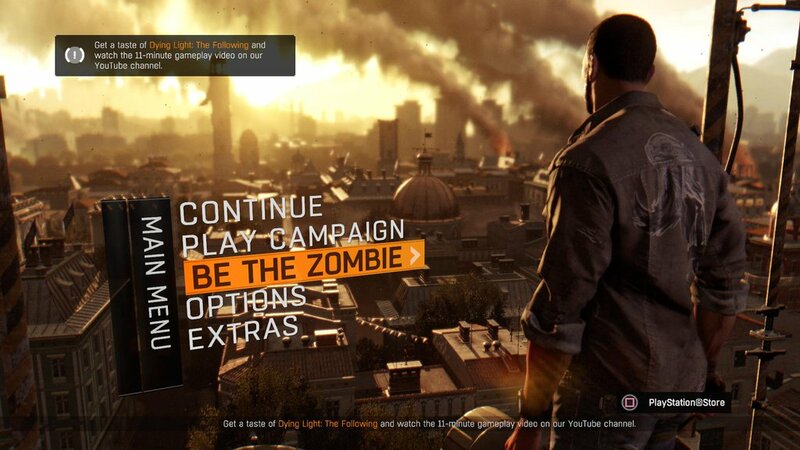 In a mode like this I imagine all the Be the Zombie game mechanics are re-worked to make it fun for both parties. Something that makes the Night Hunter function essentially like the Alien in Alien: Isolation. Making Night Hunters into something to fear and hide from. Night Hunters would have to listen carefully for clues of where the survivors are, and survivors would have to be extra careful not to get found by volatiles or make enough noise it summons virals. I think I'll make an extra thread detailing that, something I've daydreamed about from time to time, I may as well explain it in detail. Yeah this theory has been around for sometimes piltdown. But u see, the night hunter is there while crane is doing his chores throughout the game. U want to hear something more interesting? What if the night hunter is AMIR, Amir Ghoreyshi. Yeah u heard that right. We think that he's gone in the early game but maybe he's not. There's a lot of potentials! 1. He was the first GRE agent sent to Harran, so i suppose he possesses similar skills and training as Crane. Your point about his super sense and athletic can fit here. 2. 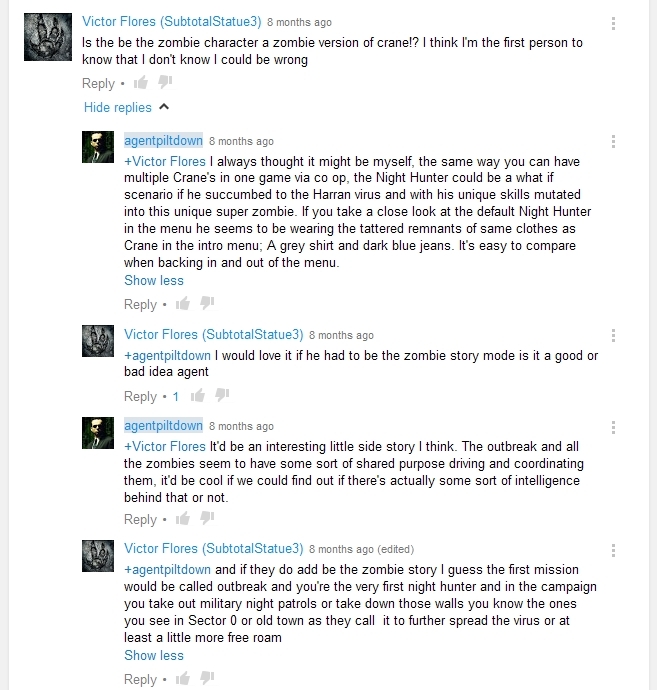 We know he used to be close with Jade before Crane comes to Harran! This could be develop into a good story. How he sacrifice himself for Crane and Jade and later re-animated, but still retain some of his human quality and intelligent. 4. The fact that Crane failed to protect Rahim and Jade (amir was close to jade so rahim should be the same) cause his anger to explode and this develops him into this new monster called the Night Hunter! (He could slowly evolve from normal biter to the current night hunter either by mutation triggers by intense hatred/ anger or consuming bolter and other stronger zombies in DL lore). 5. He keeps haunting Crane for his past mistakes and swear to avenge the death of his loved ones! Walla... What do u guys think? p/s: well they could come up with other story but just include the emotional part in it so that we really feel close and attach to this guy. Make it as a new short dlc with a good story and gameplay. Techland i would pay for this sh*t! I still subscribe to the idea that he's Reis! I posted something a while back on the theory, but the main idea was that, in his vengeance-driven madness, every Human he sees is the man who defeated him. The deformed body being damage from his fall off the Tower was another point. It was just a fun theory. Well it could be that too.. But he lose one of his arm and i'm not sure how he can regenerate that. Still an interesting theory! can u post the link of that theory of yours here? But putting aside all the issues with that, what if there's more to the Night Infected than we've ever imagined. The Following hints at domesticated zombies, The Faceless offering an alternative to zombification through faith and the will of their god. "When the world is ravaged by plague, and darkness devours the earth, when men are as beasts to one another, when humanity shall be struck by corruption of both flesh and soul, then shall be revealed one man, who, through an act of ultimate sacrifice shall accept the mercy of the light. And the god of the sun shall be revealed through him, and through him will he speak, and his voice shall be the light and healing, and he shall pass through the gates of death so that he may bring new life." That's a prophecy from the end of The Following preview Techland sent to prominent YouTubers. But I'll take no offence if you dismiss this theory hahaha, it's just for fun. I really like this theory. Amir was likely the one who helped Doctor Zere disperse his recombined viral experiment, he met Doctor Camden, who knows how close he got to the source of the infection and what he seen, as he was in Harran for a long time. He could of been exposed to something unique, and when he died, it could of took control. I like this alot too. Plus the actual Night Hunter logo is a little like a remixed version of Rais' emblem. A Rais version of a Night Hunter would be pretty scary to come across. Even if he did fall off the building, when he died the infection (he seemed to be bitten on his right arm) brought him back, made him a slave to it's will and sent him out to enforce his twisted ideology in this state as a Night Hunter. What EnlightenMe said about his arm being chopped off is true, but maybe he could come back as a Night Hunter, just not the Night Hunter. It'd be a hoot if he returned in a sequel set in those other sections of Harran with the skyscrapers and such. The clones thing is a bit too far i think. Survivors in Harran would have notice that and it's kinda weird and not fit with the main story. The part where the volatiles and runners coordinating the will of something intrigues me due to the potential of them having an elite mastermind behind their back. This could be develop into a very interesting plot, in DL 2 perhaps? Plus how do we explain the new version of volatiles in the following? It seems that the mutation may not reach its final stage yet and this open to many possibilities. I think the end of the prophecy's line points towards a hero or one that is perceived by others as their savior. Yup most likely it's Crane. Don't think the NH has that kind of reputation! Whoa that's a really good point! Nonetheless, i believe Techland also is heading towards this direction in the following, revealing more info about the hunter's origin. But according to Pete we may find more questions instead of answers in it. Well, I'm still looking forward to it. Bring it on! Oh I know, I brought that up to illustrate we accept simple game mechanics like co-op Crane as the game overlooks some of the weird implications it actually has on the story. I never was trying to say there were actual clones out Crane out there. I don't think they'd get along so much if they did, haha. And what I'm suggesting isn't even any sort of human mastermind, more like something H.P. Lovecraft dreamed up. We go in the game thinking the Harran virus is something awful cooked up in a lab by scientists, but it's actually something ancient that humans have only just rediscovered and toyed with the biological side of it without understanding there's some sort of eldritch horror controlling it. I hope we see some developments of something supernatural related to the Harran outbreak, it'll be a big twist alright, if people can get their heads around it. But, again, it's a big stretch. Of course. And I think they're talking about Crane, too. But the Followers don't seem to rate humanity as a whole very highly. Maybe they don't even mean people. Maybe when they say new life, it's not something very nice and calm, more like something... volatile. All good fun, I'm glad you made the topic. I like that you brought up Amir too, I'd like to find out more about what he saw when he was alive anyway. Yup seems the case, and I'm hyped. Where did Pete say that, if you don't mind pointing me in the right direction? And for revealing more info on the origins of things in Dying Light I don't mind something where we have to fill in some aspects with our imagination. I hope it builds towards some great story in Dying Light 2, I have my fingers crossed this game will start a new series that'll last all of this gen at least. The story suffered in the main game a little, stuff like Brecken just outright disappearing when he should of had more of role later on, more development for characters like Jade, but hopefully they can build on the groundwork well going forward and make people remember the game for the story as much as the awesome gameplay. I don't think any emotional attachment to current characters is proper for the NH. I think that more fitting story would involve some group or somebody who hate the mankind with all heart (because the murderers and rapists of his wife was set free because of corruption, the faith in humanity was lost) and release the virus while injecting to himself a largie vial to comit suicide and jump from the tower. That would explain for e.g. why the hunter farms the nests. The Harran is overflooded in Chinese Pants hype. That's an interesting thought! i think we can relate that with what's going on in the following i.e. mysterious cult that has this Resident evil 'feels' to it. Yup it could come out as something like this too. It's a cult! Oh that is what he replied to me in his pm, that the following might give us some answers or maybe just more questions. I'm sure they will pull it of, it's one of the best game since its release and is moving in a good direction imo. Well it depends on how they tell the story and the scenario u give could develop into one. But i don't think the dev will make one that will overshadows the main character, Kyle Crane. Lol that escalated quickly! your DL2 version is like the alternate version of the infamous mixed with dead space series! That's way too complex for me haha. Won't spoil it, but just see one of the endings in the following. BIG spoilers when you click on this tab. I want to talk about this alot, but I'm going to leave it a little so more people here have a chance to finish the game. Or join me behind spoiler tags using the forums feature like I just did. Oh happy happy day, and terror is born. No worries I totally understand, take your time and enjoy, I'll be here when you get the chance to respond I imagine. The Following is awesome. First of all i would like to thank Techland for making this awesome game! u hear that Techland! It's fricking AWESOME! i love everything that the single player has to offer.. U guys ROCK! The final boss fight... love it too!. 1. The virus/ serum (or whatever u want to call it) was created by the military and they have been doing some experiment, probably want to create a super soldier serum or something like that. Most likely they had it tested on human and they are fully aware of its effect- hence the fail-safe system or the nuke that they stored in the dam. So we know that the volatile arise from this. It is also clear that the mutation has not reach its final stage (we can see this on the new volatile's version in the following) and it could develop into a new breed, something like the Night hunter or a new one. Probably the first few volatiles were created from the military experiment (using the serum) and once they fully turned into one they have this brood mentality, recruiting more of them by infecting human- we see this in the following many times i.e sabit got turned into one and also the others in the hives that asking for mercy from Kyle to end their sufferings. i'm not sure how the volatiles infect them though cause i haven't finish collecting the doctor's note. 2. But what about the biters? There are 2 possibilities: 1- they are produced by the lesser version of the serum or a defective one during development process. 2- the serum could has different effect on different people depending on their genetics or resistance or whatever u can think of that is related to the body. But still, u can change into a volatile if u take the serum, just like 'the mother' as she took it before she turns into a higher version of the volatile that we see in the following. But what cause her to have this telepathic power and still retain her human consciousness? It's like she's a new breed in her own class. She mentioned about people turning on the dam's power and the electricity that woke her up- maybe this has some effect on her transformation? Maybe her genetic? Maybe it's due to prolong exposure to the serum in its gaseous form after taking the liquid one? i'm not sure about this..
3. Kyle Crane is no longer the Kyle.. or Crane that we know him. He has turn into a volatile, well a higher version of it like 'the mother' which could develop into a very unique story in the zombie's history! If u ask me about the night hunter, i still don't believe that's him. It could be someone else from the military serum project which through times, develop into its current form. The night hunter is intelligent and aggressive yet it lacks human consciousness. It still in its own class like the mother, but more like an elite soldier or something. But don't be sad, all is not lost (i believe). Kyle still retain his humanity inside of him although physically, he's now a superhuman (more like super-zombie). This is where it gets interesting, Kyle can fight the zombies with his newly found gift while finding the cure to change himself back to being all human again. I mean why not? U guys what him to end like a full chupacabra zombie that kills everyone on sight? Come on, Kyle Crane is much better than this! He will emerge victorious and comes back in glory i'm sure of it! are we gonna meet a new character that's gonna help solve the problem while Crane giving him/ her a helping hand from the shadow? What do u guys think? Crane's gotta be the Night Hunter, at the end where Crane turns into a zombie you can hear the Night Hunter's roar. No Volatile roars that way. Don't want to say that u are wrong reece, there is a possibility that the dev is following this route. 1. If the night hunter is Crane (that is after the event of the following) i can say that all the struggles and sacrifices made in order for him to reach this far are pointless. Remember that his main goal is to help his fellow friends (and other survivors) in Harran. He knows what at stake if he give the vials to them but he has this idea that Camden could help develop something better out of it. It's a long way, but he won't give up- that's what Crane is about. If he indeed turns into the night hunter, it kinda defeat the purpose. Again to me, all the sacrifices made will be pointless- just to see him develop into a hostile night creature that pounce on everybody that he sees. 2. Lets not forget that fact that 'the mother', even after becoming a human-volatile hybrid she still care about other people. She is willing to sacrifice herself and others in the infected zone to save the mankind (others outside the quarantine) because she's aware of how dangerous the outbreak could develop into.. and how it would replace the human species. So i ask again, why not Crane himself, one of the most practical and intelligent person in the game do something better if not the same? Although their methods or goals are different- The mother was conditioned to all the killings and sacrifices of her people that she decided to end their sufferings because she sees no other way to end it- she doesn't has the knowledge and networking that Kyle Crane possesses. This is the biggest different imo. Crane is an intelligent and strong-willed person, so to end the story by developing him into something sinister that goes against all the values that he hold on to as a human does not seems right to me. Well he could go through the torturing or conflicting phase where he would try to hurt the non-infected- but i'm sure he will eventually free himself from it and develop into something much better than the mother. That's how he is. Yup a new legend will be born! Well that's my opinion, again i could be wrong about it. I wonder what piltdown has to say about this.